Last week was decent for our trading efforts, we took profits on some longer term trades and now sit net long for the first time in a while. It was a mixed week of trade with April hogs on both sides of unchanged through the week. 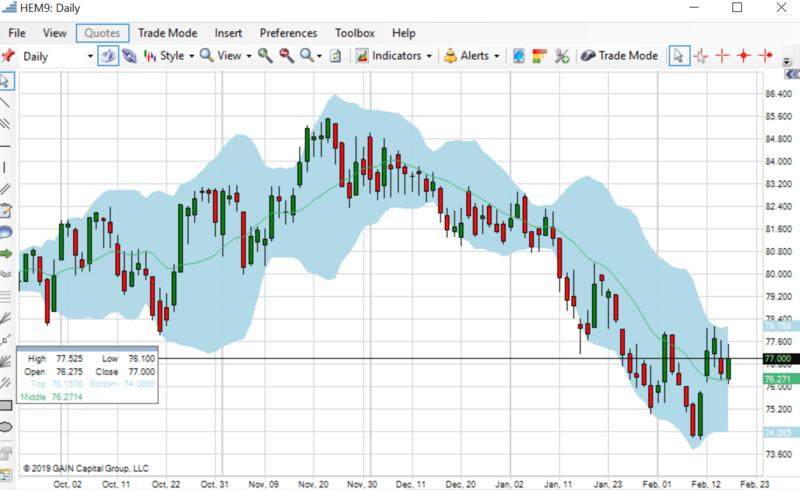 The DOJI bar seen on the daily and weekly charts should give technical buyers some confidence. The cash market continued to mark new lows on large weekly slaughter and heavy carcass weights, slaughter needs to slow for confirmation of any bottom. The desired summer futures were back adding premiums, as traders are not willing to give up on China optimism. Estimates from China are that 10-15% of their total hog herd has either been infected with African Swine Fever or already destroyed, which if true means that China will be turning to the world protein markets in the coming months to make up the losses. That has been the story for months, at some point you would think it gets traction. 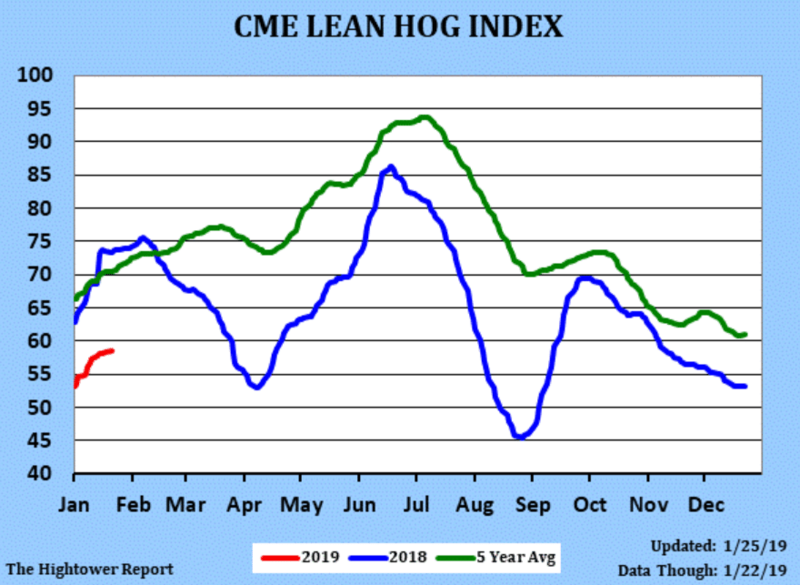 Hog futures are caught between the near-term bearishness of record hog supplies and forward optimism of large exports. It’s a holiday shortened week as winter storms are headed for the Midwest again. The snarling of northern logistics should keep pressure on bear spreads. 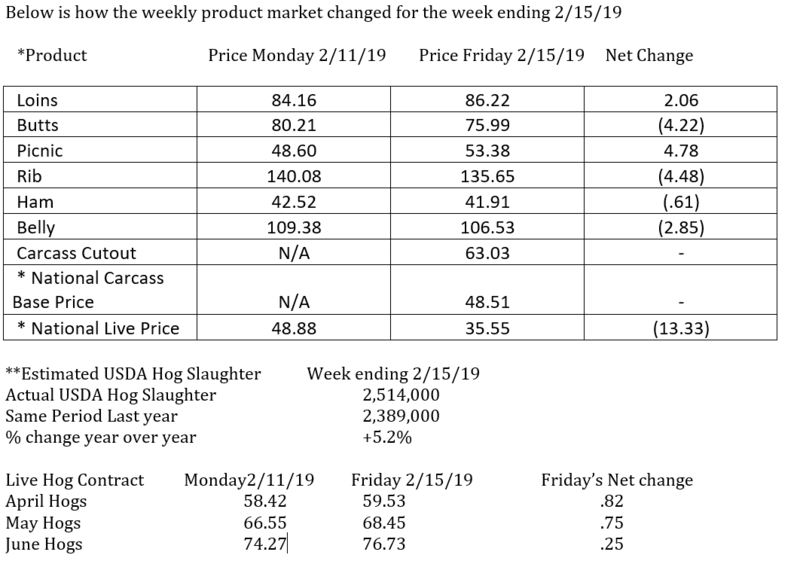 All we can say about the pork product market is what we have been saying, and that is until the weekly slaughters come below 2.4 million head the product market is going to struggle. The packer margins are at or near negative. Packers will not chase hogs with higher money in order to kill overtime, they will just cut their kills. This is what we here at Swine Times think is very likely to happen and are waiting for before jumping long on the J. The industry will need exports to offset the extra production otherwise product prices will continue to deteriorate into the spring. As a result packer margins will narrow even more. As always, continue to be particularly alert on any export news. A deal with China is more of a when right now than an if. It sounds like there will be an opportunity for Trump to put a bow on this thing in March. The weekly interior Iowa live weights were up slightly coming in at 285.8 lbs. vs. 285.6 the week prior and 284.9 a year ago. This is seasonal but we will continue to monitor and update our readers. We here at Swine Times are still looking for hard breaks in order to buy summer hogs beyond June.As we have mentioned in past letters, we want to own hog futures with multiple units when the slaughter drops 150-200 k from where it was last week. 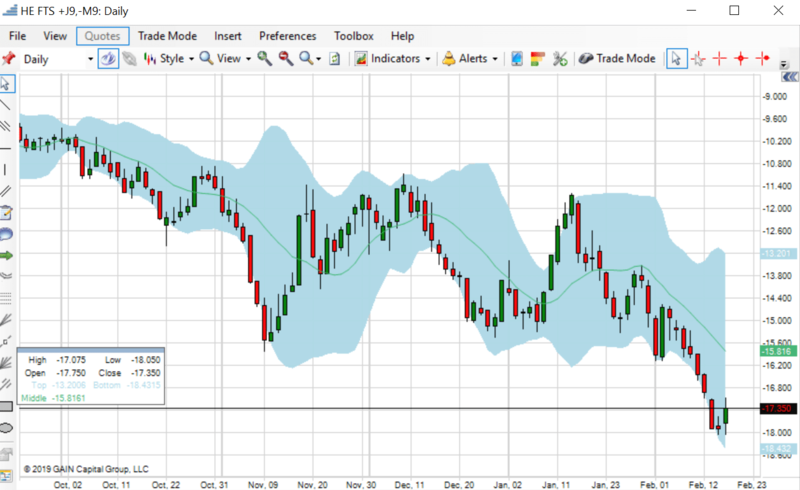 If J-M would retrace, be ready to put back on J-M spreads. .
Continue to watch for winter storms.This is the time of year when these storms occur they can push hog marketing’s further behind. Watch how the price action changes when this happens in conjunction with the live hog weights.We think this exacerbates bear spreads even further. I know it feels weird playing downside on these spreads at -15.00 and beyond but we think the carry stays wide like this as fund money will want to keep premium in June no matter how bad prices get. Funds are nearly flat in hogs, we will get updated government data for the COT and the exports this week.